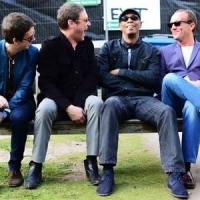 Birmingham-based rock and Brit-pop-soul outfit, formed in 1989 and featuring Simon Fowler, Steve Cradock, Oscar Harrison, Dan Sealey and Andy Bennett. The band's key period was the mid 90s with hits such as "The Riverboat Song", "You've Got It Bad", "Traveller's Tune" and "The Day We Caught The Train". The album "Moseley Shoals", issued in 1996, has proved to be their most popular and enduring, but others include "Marchin' Already" and "Painting".